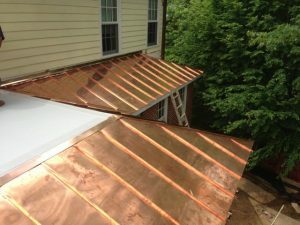 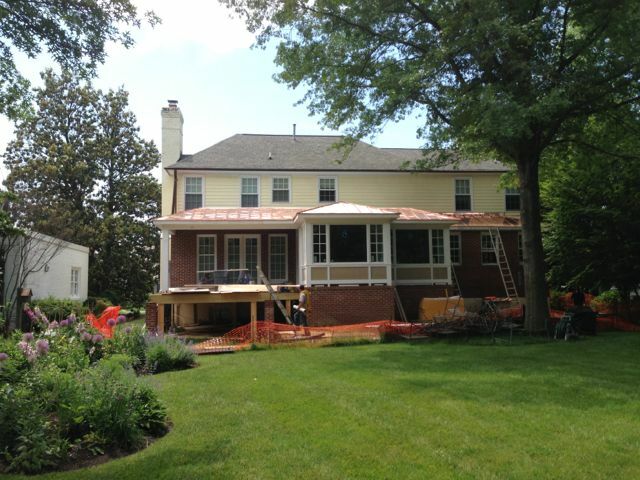 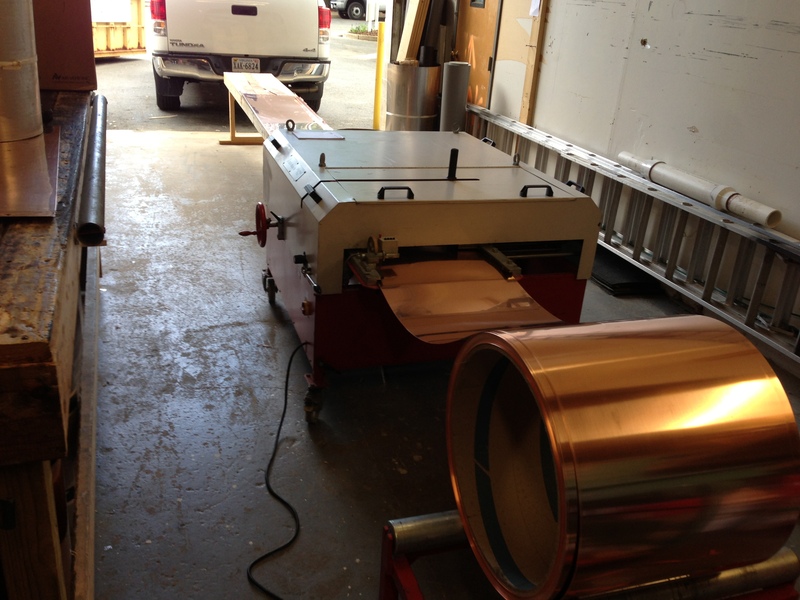 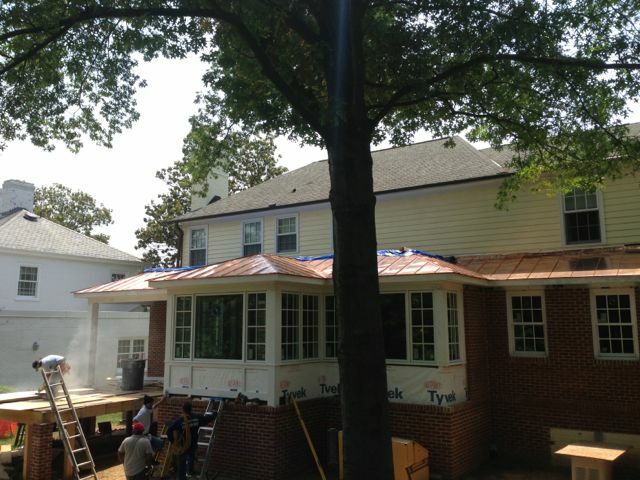 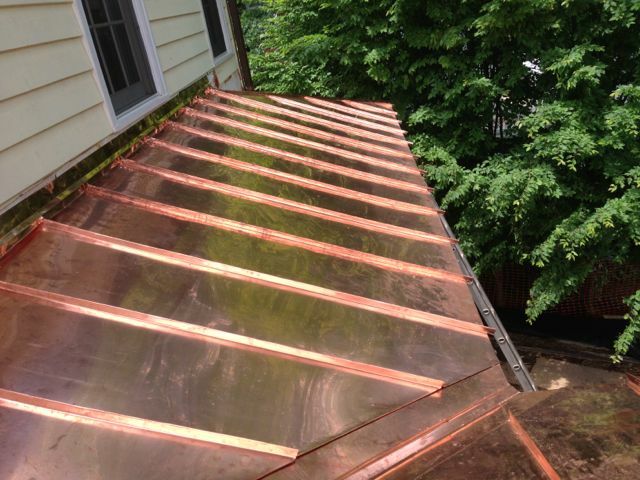 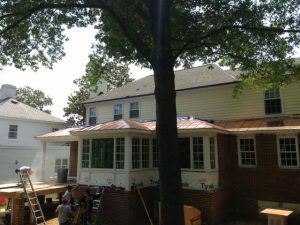 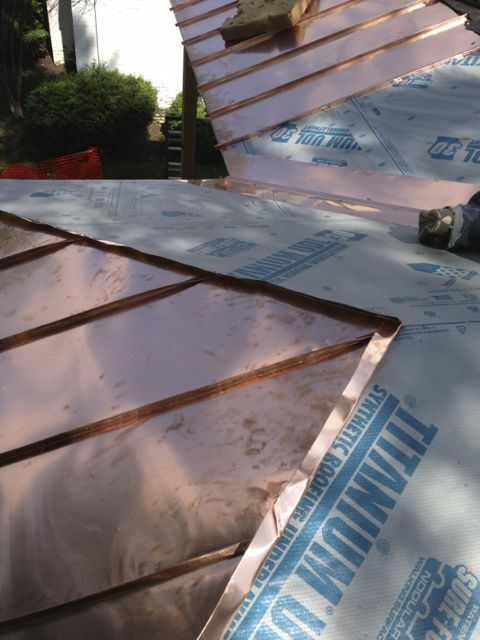 Last month we installed a new standing seam copper roof in Alexandria, VA. This is an addition to the rear of an existing house; which sadly means that once again all my beautiful work is seen by no one except the owner. 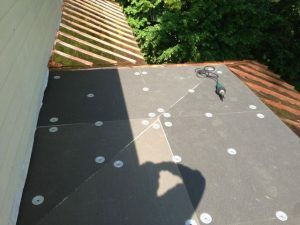 The low slope roof above it is Firestone TPO in gray; since the low slope roof was built flat we added a slight slope using tapered insulation which will drain the water off. 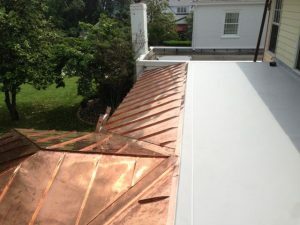 This project is a real contrast between old and new- the metal roof is installed using 150 year old techniques; once the copper begins to develop a patina only an electron microscope could tell you if my copper roof were 9 months or 90 years old. The TPO membrane roof and tapered insulation represent the very latest in waterproofing technology. 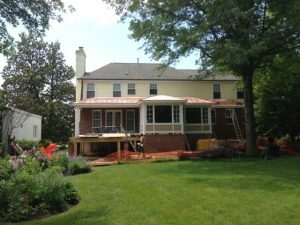 By marrying time tested craftsmanship and modern materials our northern Virginia roofing clients wind up with the best of both worlds. Our metal roof will have a service life of around 100 years, the TPO membrane roof will last around 25 years. 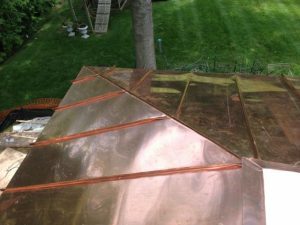 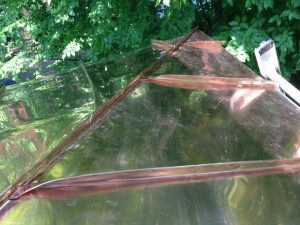 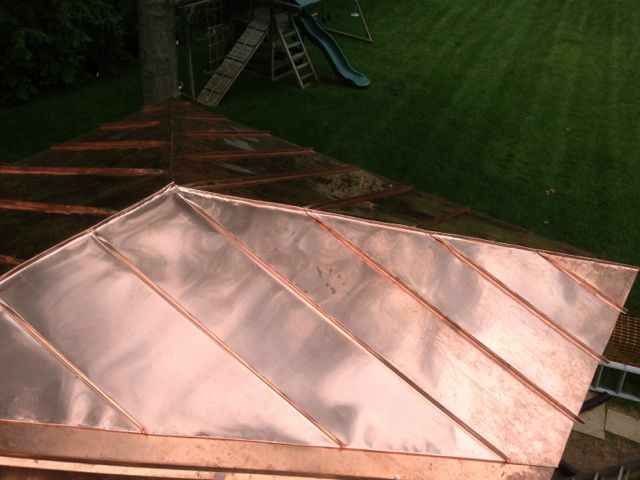 We designed the tie in between the standing seam metal roof and the tapered insulation flat roof to be easily serviceable; this means that my copper roof won’t be disturbed when the membrane roof is replaced. I made all the panels in the shop from a 1000 lb. 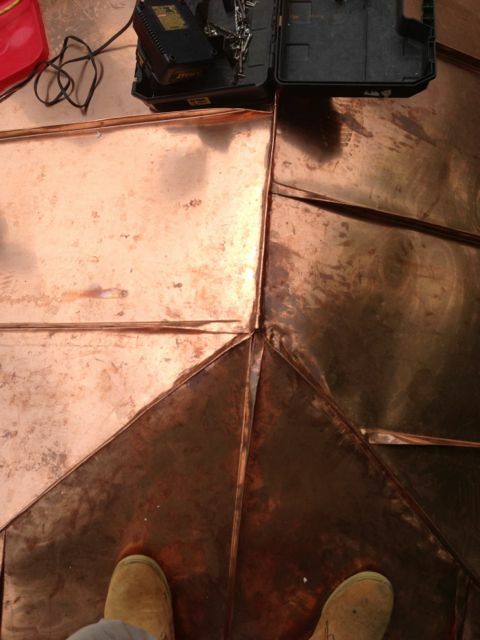 coil of 16oz copper; the copper is from Revere a company in upstate New York that was founded by Paul Revere. The machine you see is a Schlebach MPP, we use it to form roofing panels of infinite length and width; since the machine allows us to alter the width of the panel we are able to divide the roof areas up into a symmetrical number of panels. 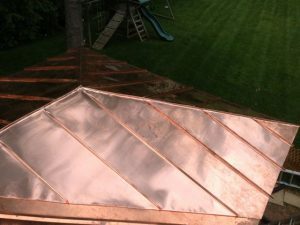 All panels are double locked to each other.